← Paper towels be gone! 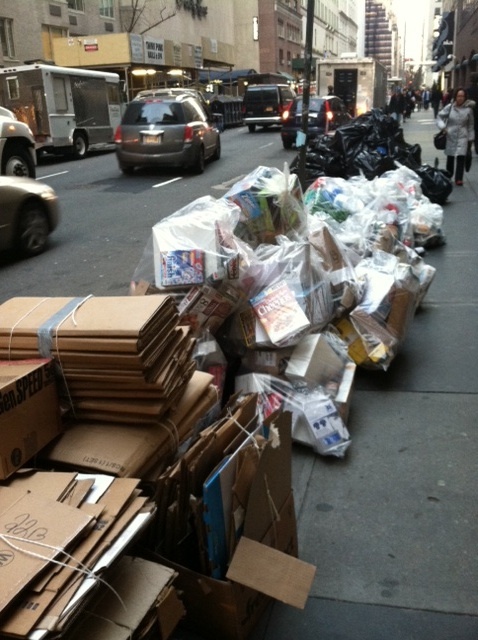 This is what urban residential trash and recycling looks like in NYC. It’s piled high on the sidewalk in front of the building (this happens to be a large high-rise apartment building in mid-town Manhattan). Typically residents are responsible for taking their trash and recyclables to a central trash room on each floor. Building personnel collects the stuff from the trash rooms, bags it and takes it to a central storage area in the building (or sometimes there are trash chutes). On garbage day they take it all outside and put it on the curb. In NYC, residential trash and recyclables are picked up by Department of Sanitation (DSNY) trucks on a route. Trash is picked up by one truck and a split truck picks up recyclables (paper/cardboard on one side and glass/metal/plastic on the other side). Citations can be issued if materials aren’t properly sorted. Part of the reason there is no charge for trash pick-up is due to multi-unit residences. No one has figured out yet how to install a pay as you throw program (or there’s been so much push back over the years that no one has bothered to go there – “fughettaboutit” as they say.) There’s also the issue of pests. I’m sure you’ve heard stories of cockroaches and rats (most of which are probably true.) More frequent pick-ups make for fewer unwanted visitors. I used to live in NYC apartments and you find out pretty quick that it is best not to let trash sit around longer than it needs to. I now live in an area of NYC that is mostly single family homes. So we take out our own trash and get twice a week service, and it’s still free. The only incentive I have for doing the right thing is, well, my conscience. This entry was posted in The Rubbish Diet and tagged NYC, Recycling, The Rubbish Diet, trash. Bookmark the permalink.